Once again, the pompous totalitarians of the New York Times are dishonestly pushing for gun registration and confiscation. The Brady Bill’s background-check requirement applies only to sales by licensed firearms dealers. Virtually all resales of guns by private individuals are left unregulated. Calling this a “gun show loophole” considerably understates matters. The entire secondary gun market is a vast regulatory void. The consequences of this gap are dire. Criminals want to avoid background checks and guns that can be traced to them. Surveys of offenders consistently show that a vast majority did not obtain their firearms from licensed dealers, thereby avoiding background checks. As you might expect in an op-ed written by a left-wing law professor and one of Bill Clinton’s former attorneys, the assertions about the legal private gun market is incredibly deceptive. 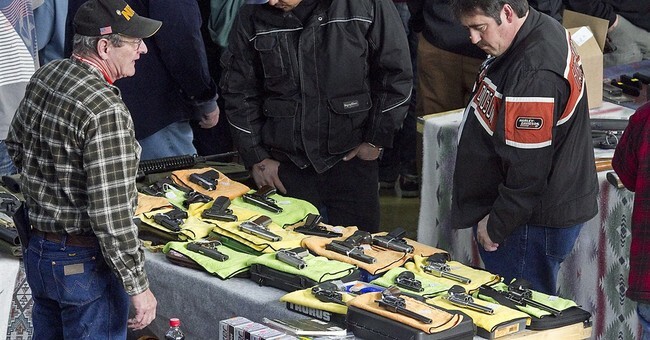 Criminals do not, in fact, buy their guns at gun shows or via personal ads. Criminals obtain their firearms through hands-on criminal social networking. Philip J. Cook, Susan T. Parker, and Harold A. Pollack conducted interviews with criminals being held in the Cook County Jail. Their primary findings were that criminals get guns from their “social network,” i.e. friends and persons known to them, but generally not from the various legal sources available to them. They do not buy guns in gun stores. They do not get guns at gun shows. They do not buy them from Internet sources. The study even found that criminals only rarely steal guns. Cook and colleagues also found that criminals do not often buy guns on the used market, as they have a fear of buying a gun from a source they do not know. Fear of police stings, or from being turned in by law-abiding gun owners leads them to obtain guns from sources they trust, most often, family, fellow gang members, and other criminals. They also found that criminals do not hold guns for a long period, fearing that a gun could be traced to a specific crime. The findings were clear. Criminals do not engage in activities that would make them subject to any sort of a “universal” background check requirement or any of the other common proposals put forth by the anti-gun crowd. As usual, this study illustrates that laws and regulations only impact the law-abiding. Mikva and Rosenthal are intentionally deceiving the readers of the Times in order to sell them on their real agenda of gun registration for the purposes of gun confiscation. A more effective system would require everyone who owns or acquires a gun to register it. Gun owners would also need a license that could be obtained by demonstrating they can use a gun responsibly, and passing a background check. Registration records would create a comprehensive database of all guns and their owners. During a criminal investigation, when a gun was recovered from a person who was not its registered owner, that person would face serious penalties. But so, too, would the registered owner if he had failed to report that the weapon was no longer in his possession. Under this system, anyone selling or possessing unregistered firearms would face huge legal risks. Overnight, gunrunning and other illegal arms trafficking would become easier to prosecute. Let’s be very clear. Gun trafficking is already easy to prosecute. Most criminals arrested with firearms are repeat offenders, and typically could be put away for a decade or more on a combination of both state and federal charges. Unfortunately, President Obama’s Department of Justice is far more interested in targeting and persecuting law enforcement agencies for imagined racial bias than it is in persecuting actual criminals caught red-handed with firearms. The Department of Justice routinely fails to prosecute federal gun crimes, and those prosecutions have plummeted even further under former Attorney General Eric Holder and current Attorney General Loretta Lynch. Gun registration serves only one purpose, and that is to create a database of gun owners for the eventual confiscation of firearms deemed “unsuitable” by the government. If Mikva and Rosenthal had the slightest bit of integrity, they’d concede the fact that registration directly undercuts the explicit purpose of the Second Amendment. The Founding Fathers were very clear that the purpose of the Second Amendment was to ensure that the citizenry retain arms of sufficient contemporary military utility to arm militias to fight both foreign enemies and against tyrannical governments. It is therefore quite obvious that a government database documenting gun ownership—creating a target list for regime forces—is in direct conflict with the explicit purpose of the Second Amendment. American citizens have a moral and constitutional duty to blatantly ignore any law requiring firearms registration. I will not comply with any such list. Nor will anyone else who believes in liberty.